Nike Skateboarding takes inspiration from Nike Running's FREE series for the all new Eric Koston Express set to debut later this year. The all new Eric Koston pro model features a lightweight, breathable mesh-based upper inspired by the Nike Free Run, sitting above a traditional SB Koston tooling. The performance-driven casual shoe is hit with a red-based colorway, finished off with white over the heel branding and rubber sole. 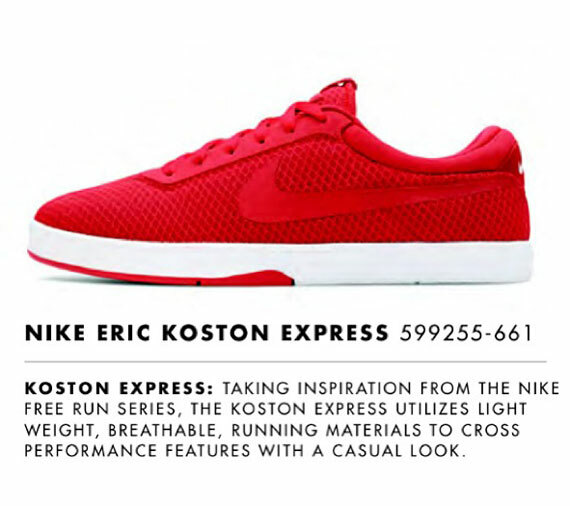 Stay tuned to Sole Collector for further details on the Eric Koston Express.